Time flies when you are having fun. It’s been 4 years since Einstein Analytics was launched! Since then Salesforce has added a long list of features every release and integrated Einstein Platform to Sales, Service, Marketing and Commerce Clouds. AI will continue to be a big focus across Dreamforce 2018 and there will be a lot of discussion on Artificial Intelligence with Salesforce Einstein. If you’re new to AI or just getting started on Einstein, please consider joining one of the following sessions and learn how we are helping data-intensive industries to adopt Einstein. Artificial Intelligence – Making It Work In Your Business on Tuesday, Sep. 25 at 10:30am in the Einstein Ridge, Moscone West featuring our CEO Charles Landry. Circles of Success for Partners: Implementation Best Practices on Thursday, Sep. 27 at 12:00pm in Partner Lodge at Park Central where Matt Wittlief, our Practice Leader shares best practices on building repeatable Einstein Solutions. Using Mulesoft to Integrate External Data to Einstein Analytics on Tuesday, Sep. 25 at 2:00pm in the Moscone West, Canyon Theater, featuring Robert Anderson. This is a recommended session for customers who are looking to integrate external data in Einstein Analytics. Unlocking Operational Efficiencies at HESS with Einstein Analytics on Thursday, Sep. 27 at 9:00am in the Einstein Ridge, Moscone West, featuring Robin Bass. Hear from HESS on how they use Einstein to track the performance of 4000 suppliers. Einstein Analytics Tips and Tricks: Dashboards, Dataflows, SAQL on Thursday, Sep. 27 at 3:00pm in the Marriott Marquis, Yerba Buena Salon 8, featuring Akshay Ahuja. Akshay is going cover tips & tricks that will make you more productive working with Einstein Analytics. Create Rich Infographic Experiences with Custom GeoJSON on Friday, Sep. 28 at 9:30am in the Marriott Marquis, Golden Gate – Pinnacle Theater, featuring Nicolai Johnson. This is a must attend for advanced users who are looking to build custom visualization in Einstein Analytics. Einstein Analytics: SAQL Deep-Dive on Thursday, Sep. 27 at 9:30am in the Canyon Theater, Moscone West, featuring Matthew Kriebel. Matt is going to cover new features in Einstein Analytics and how to take advantage of them. If you’re interested in some quality, one-on-one time with our experts, you can find us in the following locations. If you want to speak one-on-one with one of our experts, see our solutions in action and hear a few customer case studies, come by Einstein Ridge in Moscone West. 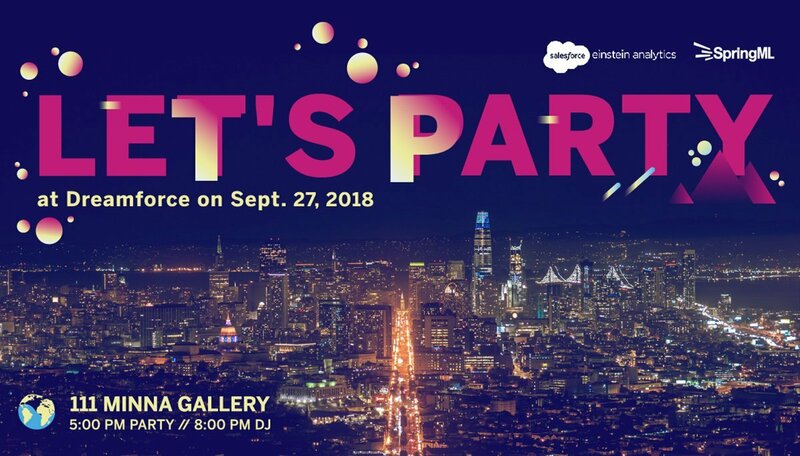 Join us as we light up the night and celebrate our partnership with Salesforce, with a focus on equality and sustainability! The event will feature ‘dj christopher b,’ raffles, food, specialty drinks, and will be entirely illuminated by energy efficient LED glow sticks. The party starts at 5 pm, with the DJ taking the stage at 8 pm, and ends whenever you want it to! So close out Dreamforce with us and let loose with SpringML! Dreamforce 18 is going to be the best yet. For more information on SpringML events and speaking engagements visit our Dreamforce site.